That implementation was done under a contract from DFKI and funding from the European Commission (project LT-Web), 7th Framework Programme (FP7), grant agreement n° 287815. The code is Open Source and will be available with forthcoming version 1.8 of BlueGriffon. At the fourth annual META-FORUM conference in Berlin on September 19/20, it was announced that Disruptive Innovations was awarded the META Seal of Recognition for BlueGriffon. 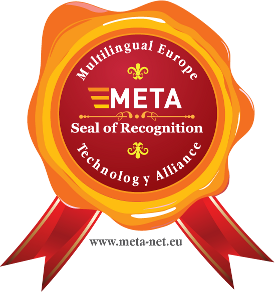 The META Seal of Recognition recognises excellence in software, products, and services which actively contribute to the European Multilingual Information Society. The META Technology Council, a panel of 30 experts drawn from the European Language Technology landscape, recognises the contribution BlueGriffon makes to the European Multilingual Information Society. META, the Multilingual Europe Technology Alliance brings together researchers, commercial technology providers, private and corporate language technology users, language professionals and other information society stakeholders. META is preparing the necessary ambitious joint effort towards furthering language technologies as a means towards realising the vision of a Europe united as one single digital market and information space. The META Seal of Recognition is awarded annually to select products and services which actively contribute to the initiative’s goals. This year is the third time the META Seal of Recognition has been awarded at a special ceremony as part of META-FORUM 2013 held in Berlin, Germany.